There's Nothing Like the Real Thing, Baby! I was browsing through my collection of photography related quotations the other day, choosing one to put on the front page of my web site, when I noticed an interesting thing: quite a few of those quotations come from one source—a slim little book titled Beauty in Photography: Essays in Defense of Traditional Values , by Robert Adams. For a long time, Robert Adams’ photographs left me cold. Judging by the comments I’ve seen in online forums when his work is discussed, that’s not an unusual response. There are a lot of folks who look at his photographs and think “What in the world is this guy trying to show us?” Adams’ photographs were a puzzle to me—the irritating sort, where you suspect that there’s something there but perhaps the artist has gone somewhere you can’t follow. Then I wandered into a little bookstore and found Beauty in Photography there on the shelf, and I bought it. When I read it, I thought back over his photographs in my memory, and they started to make sense. 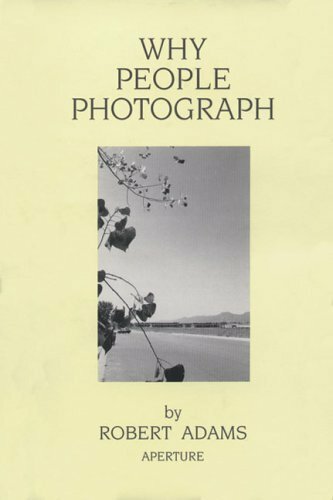 A few years later, I snapped up a copy of Why People Photograph , which is a sort of companion volume [actually more of a sequel—BiP was published in 1981 and WPP in 1994 —MJ]. 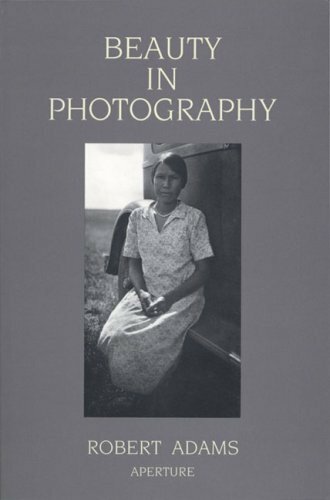 Like Beauty in Photography, it’s a collection of essays. And again, a few of Adams’ photographs became more understandable to me. It’s not that the two books directly talk about his photographs. It’s that his overall philosophy is there, laid out in his straightforward, direct prose. If, like so many folks do, you look at Adams’ photographs and wonder what it’s about, you might find Beauty in Photography and Why People Photograph interesting reading. Robert Adams third book 'Along Some Rivers, Photographs and conversations' is excellent and complements the previous two. These interviews through further light on Adam's work and a genre that informs us of the contemporary landscape. The book also contains some excellent images. Not one hour before reading this post I was at the Center for Creative Photography in Tucson, AZ where a Robert Adams show just opened. I too came away from his photos wondering "What in the world is this guy trying to show us?" Strange coincidence! I picked up Adam's book on the suggestion of Michael Johnston's list of photo books to read. I found it very easy to read, and very insightful. I've read it twice. I own and have read Adams's "Why People Photograph" and have seen some of his work. Personally, neither his writings nor his images really seem to warrant the buzz that he seems to generate but I cannot claim to have seen enough of either to offer an authoritative opinion. Perhaps in 10 years my opinion will be different (or, more likely, I'll not remember ever hearing of Adams...or my wife, or of photography). For those interested in more info on Adams there's a big Adams show just wrapping up at the Getty. The show's site offers some of his images and narrative. One way to look at Adam's work and I stress one way is to think of Adam's in the manner of Atget. There is a formal poise that balances a representation with the exterior world with an internal ('spiritual' - not religious) questioning. With Atget it was Paris and its environs and with Adam's the American landscape. Further to the comment by Anonymous: an additional way to look at Adams is that a lot of the time (I think) he's been really pissed off and full of anquish, something I understand completely. If you've intimately known the West's most sublime beauty--as Adams has--and then watched it get turned into crap, it kinda hurts. In his darker images, Adams has found a way to express this anquish, but with a formal beauty that compels us to look. I like his work a lot. He is an exceptional writer, too.